There are 8 Fibonacci Tuners. To tell them apart they are labeled by ratios based on the Fibonacci number series which starts with the number 1 and grows by adding the last two numbers in the sequence together to produce the next number. The Fibonacci Tuners follow the number sequence with the first Fibonacci tuning fork being 1/1, followed by 1/2, 2/3, 3/5, 5/8, 8/13, 13/21, and 21/34. The Biosonics Fibonacci Tuners are part of a continuum of sound that spirals in and out of different realities. Imagine children walking down the beach picking up sea shells and putting them to their ears. The sound inside the sea shell is the same as the sound created by all the Fibonacci Tuners. Children enter the sound of the sea shell sound much like Dorothy in the Wizard of Oz being transported by a cyclone to the land of Oz or Alice going down the rabbit hole to discover Wonderland. They discover realities within realities. When we listen to the Fibonacci Tuners, like children going inside a seashell, we naturally seek out alternate realities within the sound. Each alternate reality is a location within a spiral revolving around a central vortex of stillness which connects with the Universal Energy Field. In many instances it may be more effective to work in an alternate reality to effect healing then in normal reality. This is no different than a psychotherapists using dreams or a reflexologist pressing points on the feet, hand, or ear to effect healing within the whole body. In cases of trauma and addiction people often times disassociate into alternate realities. The Fibonacci Tuners create a bridge between these realities which can promote a healing response. There are 8 Fibonacci Tuners. To tell them apart they are labeled by ratios based on the Fibonacci number series which starts with the number 1 and grows by adding the last two numbers in the sequence together to produce the next number. For example 1 is added to 2 to produce 3 then 3 added to 2 to produce 5. The sequence looks like this: 1,1, 2, 3, 5, 8, 13, 21, 34, ..n. The Fibonacci Tuners follow the number sequence with the first Fibonacci tuning fork being 1/1, followed by 1/2, 2/3, 3/5, 5/8, 8/13, 13/21, and 21/34. When creating a Fibonacci interval always use the 1/1 Fibonacci tuning fork to create the interval you want. For example to create the interval 2/3 use the 2/3 tuning fork wth the 1/1 tuning fork, or to create the interval 13/21 use the 13/21 tuning fork with the 1/1 tuning fork. It is also possible to mix any two or more tuning forks and explore the micro intervals they create. For example you can tap the 8/5 tuning fork with the 21/34 tuning fork. How to Uses Fibonacci Tuners? Look at the Fibonacci interval chart and choose which interval you want to explore. Hold your tuning forks by the stems with moderate pressure, not to tight and not to loose. 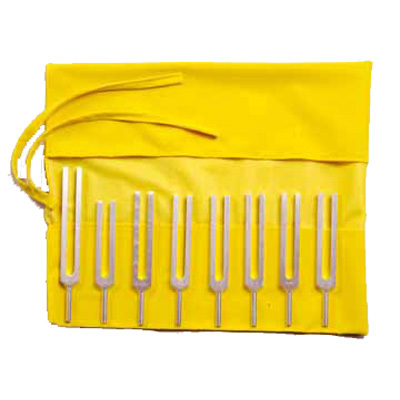 Do not hold your tuning forks by the prongs because the prongs need to vibrate in order to create a sound. Gently tap the flat side of the tuning fork on your knee cap. Do not hit your knee cap. All it takes is a gentle firm tap and your tuning fork will sound. It is best to tap the 1/1 Fibonacci Tuner on the knee and then the interval you want to explore on the other knee. Bring the forks slowly to your ears, about three to six inches from your ear canal, and listen to the sounds. The second way to sound the Fibonacci tuning forks is to tap them together. This method is to be used off the body. It is not to be used directly in the ears. Hold them by the stems and tap them together on their edges, not the flat side of the prongs. You do not have to use a lot of force to get the result and play with creating an easy sounding tap vs. a banging tap when too much force is used. When you tap them together the tuning forks will make sounds we call overtones. Move the tuning forks around, slow and fast, in the air and listen to the different tones as they get louder and softer. For practice, take the 2/3, 5/8, and 13/21 Fibonacci Tuners hold them in your left hand. Place the stems between your fingers. Allow them to stick out in different directions so that they do not touch. Hold the 1/1 tuning fork between your thumb and first finger in your right hand. Tap the three Fibonacci Tuners with the 1/1 tuning fork. Move the tuning forks around slow and fast and listen to the different overtones. Move them around and move the 1/1 tuning fork in circles underneath the 2/3, 5/8, and 13/21 tuning forks. The movement of the 1/1 tuning fork will bring out different overtones.